DURING THE SEARCH FOR A NEW AIR CONDITIONING SYSTEM, HOMEOWNERS NEED TO KNOW THAT THEY ARE RECEIVING ALL OF THE BENEFITS THEY DESIRE IN THEIR NEW HVAC UNIT. 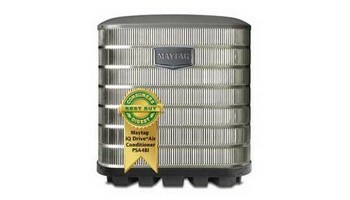 A MAYTAG AIR CONDITIONER COMES WITH A SELECTION OF BENEFITS THAT INCREASE THE PERFORMANCE AND LONGEVITY OF THE UNIT. BENEFITS INCLUDE PROVEN COMPONENTS SUCH AS COPELAND SCROLL COMPRESSORS FOR RELIABLE PERFORMANCE AND LOW SOUND LEVELS AS WELL AS OUR EXCLUSIVE 12-YEAR LIMITED PARTS WARRANTY AND 12-YEAR DEPENDABILITY PROMISE. NOT ONLY WILL A MAYTAG AIR CONDITIONER OPERATE EFFICIENTLY AND AT LOW SOUND LEVELS, BUT HOMEOWNERS CAN ENJOY LONG-LASTING PEACE OF MIND AND QUALITY ASSURANCE WITH THIS LONG WARRANTY.MAYTAG AIR CONDITIONERS ARE FACTORY CHECKED 144 TIMES BEFORE BEING SHIPPED, OFFERING QUALITY ASSURANCE WITH EACH OF OUR AIR CONDITIONING UNITS. BECAUSE OF THESE FACTORY CHECKS, OUR AIR CONDITIONING COOLING UNITS HAVE A REDUCED RISK OF PROBLEMS AFTER INSTALLATION DUE TO FACTORY ERRORS. PREMIUM SOUND REDUCTION COMES STANDARD WITH THE IQ DRIVE AIR CONDITIONER. THIS UNIT RUNS AT SOUND LEVELS DOWN TO 59 DBA. THE IQ DRIVE AIR CONDITIONER DOESN’T OPERATE LIKE A TYPICAL AIR CONDITIONER. INSTEAD, IT CONTAINS INVERTER-DRIVEN ROTARY COMPRESSOR TECHNOLOGY THAT ALLOWS IT TO MODULATE FROM 40% TO 118% OF CAPACITY, RESULTING IN INCREDIBLY EFFICIENT PERFORMANCE – UP TO 25.5 SEER! THE IQ DRIVE AIR CONDITIONER WILL CHANGE ITS SPEED IN SMALL INCREMENTS TO IT’S ALWAYS MEETING THE EXACT COOLING DEMANDS ON THE HOME. YOU’LL HAVE A BETTER MIX OF AIR WITHOUT HOT AND COLD SPOTS.THE DEHUMIDIFICATION ASSISTANCE PROVIDED BY AN IQ DRIVE SYSTEM IS A RESULT OF THE LONGER RUNNING TIMES AT LOWER LEVELS OF OPERATION. THIS CAN HELP GIVE YOU AN ADDITIONAL HOME COMFORT BOOST. GET MORE THAN JUST SUPERIOR ENERGY EFFICIENCY WITH THIS UNIT’S IQ DRIVE CONTROLLER. THIS THERMOSTAT ALLOWS YOU TO PROGRAM YOUR HEATING AND COOLING SYSTEM WORK AROUND YOUR SCHEDULE. IN ADDITION, IT PROVIDES MAINTENANCE REMINDERS AND TROUBLESHOOTING DIAGNOSTICS THAT HELP YOU STAY ON TOP OF YOUR SYSTEM’S HEALTH. : THIS JACKET PROVIDES A HIGH DEGREE OF CORROSION RESISTANCE. TOP AND CONTROL PANEL ARE DESIGNED WITH GALVANIZED STEEL COATED IN A CORROSION-RESISTANT, POLYESTER-URETHANE FINISH. THE MAYTAG ECOLOGIC GREEN SEAL HELPS DISTINGUISH THOSE PRODUCTS THAT ARE NOT ONLY EFFICIENT BUT ADVANCED AS WELL. THIS UNIT QUALIFIES FOR THE ECOLOGIC GREEN SEAL. THE PSA4BI AIR CONDITIONER EXCEEDS ENERGY STAR'S REQUIREMENTS FOR EFFICIENT EQUIPMENT IN CERTAIN SIZES AND MATCHES. EACH OF OUR HIGH-QUALITY AIR CONDITIONING SYSTEMS ARE CHECKED REPEATEDLY BEFORE THEY ARE SHIPPED TO YOUR HOME. THIS UNIT IS CHECKED 144 TIMES BEFORE LEAVING THE FACTORY.ENJOY THE BENEFITS OF ULTRA-HIGH-EFFICIENCY COOLING PERFORMANCE WITH THE PSA4BI SERIES OF IQ DRIVE AIR CONDITIONERS. WHEN PROPERLY MATCHED WITH OUR IQ DRIVE AIR HANDLERS OR GAS FURNACES, THIS UNIT RECEIVES REMARKABLE, UP TO 25.5-SEER EFFICIENCY. IT HAS ALSO BEEN VOTED A TOP CHOICE BY A LEADING CONSUMER MAGAZINE.